One of the major challenges of making any sort of predictions, and an equally serious source of contention in International Relations theory, is how to deal with the rationality of actors. The simplest answer, favored by many 20th century revisionist historians is that actors do not matter. History is made by great forces, the movements of masses of the population and great economic forces. Originally promoted by Marxists to highlight the predominance of economic theory in the direction of political and geopolitical conflicts, it has been seized upon in the modern era by "People's Historians" on the left to highlight the importance of role of diverse actors(women, non-whites, etc) in contrast to a predominantly white male canon, and by IR theorists to justify not bothering to familiarize themselves with the contexts of any of the case studies they use to promote their arguments. But like most absolutist positions it is both wrong and lazy. Yes, the assassination of Franz Ferdinand in 1914 could not, on its own, have triggered a major war if the ingredients were not already present. Nonetheless, those ingredients had been present for some time and had not resulted in a general war, and it is hard to see how, if he had not been assassinated a war would have broken out in 1914 absent a similar incident. Brexit, today is a great example of this. Undoubtedly it is the result of great historical forces. The decline of the British Empire, the mass migration brought about by the conversion of the UK from an industrial to a service economy, encouraged by the New Labour government of Tony Blair, but an inevitable consequence of the economic decisions made by Margaret Thatcher, contributed domestically. The international financial crash meant that the government elected in 2010 would pursue austerity, and the involvement of the Liberal Democrats in it ensured their collapse. The Conservative majority in 2015 was not built off the defeat of Labour but taking seats off of the Liberal Democrats, whose misfortune it was to have enjoyed most of their gains since 1992 at the expense of the Conservatives. In turn that Conservative majority made the referendum possible. That referendum occurred at the worst possible time, coming in the midst of the refugee crisis created by the Syrian Civil War. It is unclear if Leave could have won a 2017 vote. Once the referendum happened, the nature of the situation in Northern Ireland, the internal dynamics of the Conservative party, and the interests of the EU all conspired to ensure it would be almost impossible for a Tory government to reach a politically advantageous agreement with Brussels. Because the British weakness was driven by internal divisions, this also made it likely that the longer the process went on, the weaker the British position would become, which is the one insight in the widely mocked article by Donald Trump jr. Yet for all that events conspired to craft a prison, not just Prime Minister Theresa May, but the entire British political class has been remarkably comfortable in remaining confined in that prison rather than making even half-hearted efforts to escape. Almost every problem that arose was foreseeable, and most were flagged by multiple observers. Yet no one in a position of influence made any efforts to plan ahead. Not May, not her hard-line foes(with the potential exception of Michael Gove), not the Labour leadership. Even the Civil Service seems to have largely embraced illusions about how its leaders would act. The current crisis is shocking to observers then not because its aspects were foreseeable, but precisely because they so obviously were. Because the EU and other observers knew how this was going to go, and knew their counterparts in London had that knowledge available, they assumed they would act on it. And here we run into the issue of "rationality" v. predictability. The error the EU and others made was to assume a level of rationality to British actions which did not occur. They assumed that with information available to make a reasonable judgement of their strategic position, British leaders would do so and act accordingly. Even when they failed to do so, the assumption was based on the idea that they were acting "rationally" on a different frame of reference. Namely for domestic reasons. This highlights the first problem with rational actor analysis, namely that "rational" can mean many things and is almost always individual. The problem is that while British politicians might be seeming to act irrationally, that does not mean there is no pattern or it is unpredictable. At almost all stages, Theresa May has chosen to postpone decisions when possible, and avoid breaking with all sides. Some see this as a product of political weakness and it likely is. But it is also in keeping with a wider and more global political tradition. British politics is incredibly conformist. David Cameron's decision to hold the referendum in the first place was an act of "can kicking" as is Labour's current approach to the prospect of a second referendum. Corbyn himself was elected partially due to the refusal of Labour's elite to make up their mind to oppose welfare reforms proposed by the Cameron government. "Fudging" is not a Theresa May innovation, as if she could ever innovate. Rather it is increasingly a political trait of the British elite. In its older and more distinguished variety it helped Britain avoid violent upheaval and revolution. But the same compromising spirit which allowed three Reform Acts and the Reform of the House of Lords, also led directly to the Munich Agreement. Chamberlain too has defenders who argue that his concessions to Hitler were strategic moves aimed to buy time, and no doubt some made those arguments to him, but the overwhelming evidence is he genuinely hoped to avoid war, and bet that "something would turn up" if he just bought enough time. The corollary of delaying decision-making to the last minute is that when it in fact occurs it is rushed, poorly conceived, and has no clear objective. Britain went to war with Russia in the Crimean war without a clear objective once the Russians withdrew from Turkey leading to a pointless campaign in the Crimea. Going to war with Germany over Danzig, an indefensible city which was 90% German with an elected Nazi government made no sense after the Nazi-Soviet pact, whereas defending Czechoslovakia did. 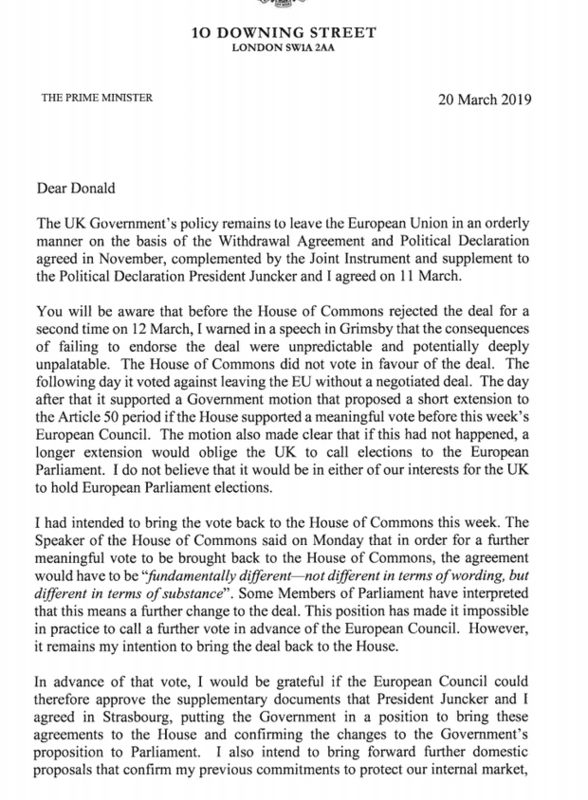 Today we see that in the almost embarrassing letter Theresa May wrote to the EU requesting a short-extension to June 30th. Edited at a level which would earn a student a rebuke from a Professor at University, it includes a long rant against Parliament, no real plan going forward, and is about twice as long as it needs to be get the point across which is that Theresa May really wants a long extension but can't afford to ask for one so needs the EU to engage in a dance. But it also implicitly communicates something else. May almost certainly spent ten times as much time arguing with her cabinet about what to put in the letter and wondering what they would think of it than she did drafting it and asking what the EU would want. And that is evident to the EU, who didn't even bother receiving it before rejecting the proposals. Two weeks ago, before Theresa May's deal had even been rejected for a second time, I predicted a long-term extension of Brexit and the holding of EU elections. I still believe that will probably happen. It is in the interests of all parties. The UK is not capable of undergoing Hard Brexit, the EU is but has no desire for it, and it delays the issue. But one thing it requires is for May to realize that her Premiership is over and manage to play the role of accepting it. One assumes, as I did that she is aware, as everyone else is, that she is on borrowed time, but indications earlier today are that she does not and is desperate to buy a longer tenure of Number 10, even if it is only until April 11 when she will have to decide on European elections. But if she genuinely refuses to send the letter then all bets are off. Of course there might be rational reasons why she is doing this. It might be a maneuver to ensure the EU forces her to accept a longer extension, in which case she is spending, by this point mortgaging, the time of EU leaders. But there are less strategic explanations. It is possible that she wants to be a martyr, having been betrayed by both Remainers and Leavers, she is determined not to save them from themselves. That prospect at least has to be considered. The important thing, however, and the reason why there is a crisis is that no one, especially not the EU can be sure. She may be playing games, in which case they have a right to be angry, but there is a real worry, or must be, that she either is genuinely delusional about her own prospects, or she no longer cares and is on a kamikaze mission. In either case, Brussels needs to look to itself and its own No Deal planning, which seems to be where the EU is heading based off hints yesterday. The Extension is still plan A, but plan B seems to be for a temporary No Deal of 2-3 weeks after which it is assumed Britain will be forced by reality to accept a modified version of the withdrawal agreement. The EU is unlikely to embrace "No Deal" full-stop. but what I might term "Temporary No Deal" increasingly seems to be viewed as a viable option to bring reality to the situation. It would also resolve Martin Selemyr's fears that in the event of an extension the UK would not hold EU elections and then withdraw A50 after everyone else had. A50 could no longer be revoked after the UK left the EU. This should worry London. Right now London still has a single piece of leverage, A50 revocation. A temporary no deal would remove that, and London would face the need for an agreement with less leverage having already suffered enormous damage. Increasingly, I suspect that is a real possibility.